You may be thinking about going off on an adventure yourself; if so don’t be surprised if it includes romance. Alternately you may be planning a trip on your own, getting away from it all, or heading off into the wild blue yonder yourself. 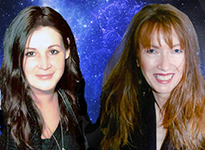 Whatever you decide, pay attention to the messages you send and receive. With a boatload of sextiles among harmonious planets today you can expect these types of communications to flow with ease. 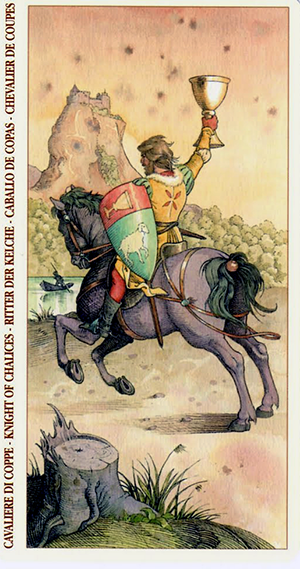 The card used for today’s tarotscope — Knight of Chalices — is part of the Tarot of Durer series. This beautiful deck pays homage the German artist of the Renaissance era, Albrecht Durer. Written by Manfredi Toraldo and illustrated by Giacinto Gaudenzi. This is a Lo Scarabeo deck, distributed by Llewellyn.